1993. Pen & ink. 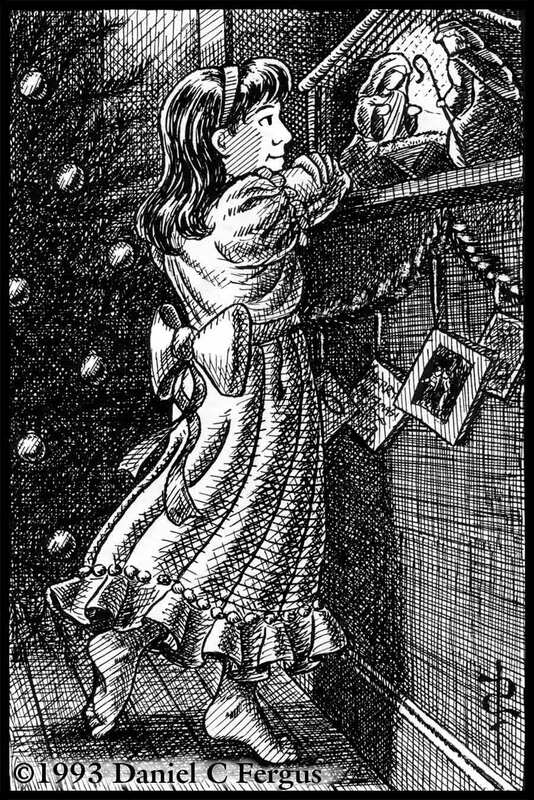 4½" x 6¾"
In 1993 I was determined to return to the “girl in the frilly dress” motif that I had used twice before for my Christmas cards (1990 and 1992), but I couldn’t come up with a concept that really appealed to me. Running short on time, I drew this piece, one that unfortunately lacks the humorous tone of the previous cards. At the time I was not very happy with it, but my opinion has softened and I have grown to like it. A crèche, by the way, is a Christmas stable tableau, often referred to as a “manger scene.” Note the previous year's card (Pleasant Surprises) hanging from the garland just to the right of the girl.